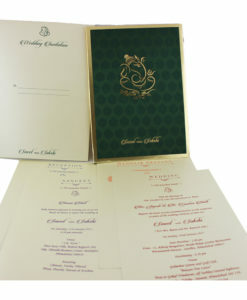 Select the card you like and Fill up the Qty as you want it along with your requirements. 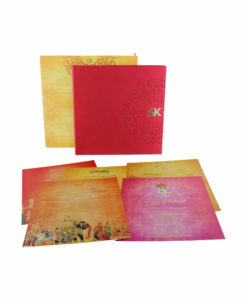 For Example : Quantity of Wedding Cards Required, Number of Inserts to be kept inside each wedding card, Card Printings. 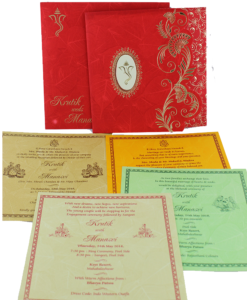 Also Accessories like, RSVP Cards & Covers, Thank You Cards & Covers, Table Cards, Program Book, Carry Book. Add it to Cart according to you wish. Press the Check out and Fill up the Form with your Details and shipping requirements. 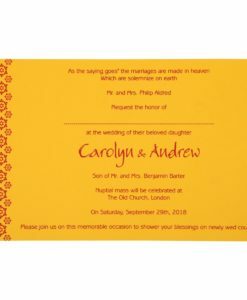 You can order blank invitation cards too. If you want to print the content locally, you can mention that in your requirements. After you finalize the design and place the order, you will have to send us the final content to be printed and we will design it according to the layout of the card and send the digital proof for printing approval in 2 business day. The process will be repeated until you are satisfied with the digital proof. Once you approve the digital proof, we will start the bulk printing and the cards will be ready in 9-10 business days.